Beverly's Official Blog | News and findings from world of crafts, scrapbooking and more: Home Decor Idea - Fabric Covered Canvas! Home Decor Idea - Fabric Covered Canvas! Spice up your home decor with this super easy idea. 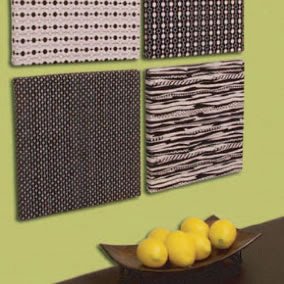 Beverly's makes it affordable with great prices on studio canvas and a sale on Michael Miller Fabric. You can find our "How-To" here. Bill Blass said, “Style is primarily a matter of instinct.” Decorating takes on a new meaning for each individual. Clever and chic for Janie may be yesterday’s yawn-fest for Carol. Different tastes in dècor mean different furniture, artwork and color palettes. So what is the rule of thumb for making your place zing if it’s not a certain style, pattern, or color? Bold, baby! Bring out the Y-O-U! Patterns are all the rage now, too. Twists and twirls, paisleys and pearls! Did you ever in a million years think of dotting stripes and striping dots? Designers these days are pulling out all the geometrical stops. Paisley mixes with all sorts of combinations-checks, polkas, and weathered solids. Discover a new way of looking at the world around you in different shapes and designs. Fabric Covered canvas is great idea for decore. I believe we can have a blend of alphabet photography name art frames for kids as well as for adults rooms. This will make a unique affect.